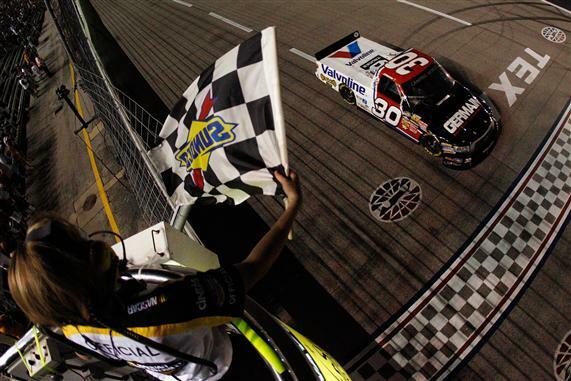 FORT WORTH, Texas—Todd Bodine added to his resume as the Camping World Truck Series' winningest driver at Texas Motor Speedway on Friday night with an overtime victory in the WinStar World Casino 400k. Bodine drove away from four-time and reigning series champion Ron Hornaday Jr. and Timothy Peters on a green-white-checkered flag restart to notch his sixth career victory on TMS' 1.5-mile oval, and third in the summer event here. Bodine snapped a 24-race winless streak dating to June 5, 2009. Johnny Sauter finished second, followed by rookie polesitter Austin Dillon, former series champion Mike Skinner and super-sub Ken Schrader. Bodine's margin of victory after 169 laps was 1.007-seconds. Bodine, 46, scored his 18th career series victory and 11th in 53 starts on a 1.5-mile layout. Bodine and Kyle Busch each have scored six wins at TMS, with Busch working on a five-race Nationwide Series streak. The Sprint Cup regular also has one truck series win. "It's an honor anywhere to say you've won the most races at a track. It's pretty awesome," said Bodine, nicknamed "The Onion" for his bald pate. "We're proud of the fact we can come to Texas and run this well every time. It's someplace we enjoy and being the only six-time (truck series) winner … it was a goal when Kyle won five to come back and win another one. To get that done, I'm pretty proud of that." Bodine led a race-high 106 laps en route to his first victory and seventh top-five finish in eight 2010 races. "We've been struggling all year to make the trucks drive good, and this truck was driving fast and wide open. It was fun to drive," Bodine said. "We had a great Tundra. It was an awesome night all around." Crew chief Mike Hillman Jr. said his Germain Racing crew tries to treat all the series' 1.5-mile layouts the same. "But it seems we get our stuff figured out this time of the year," Hillman said. "I'm really proud of our guys. We went to work this winter making our trucks lighter and better. I can't say enough about how hard everyone at Germain works. I'm the lucky guy who gets called the crew chief." Dillon, the grandson of team owner Richard Childress, capped his first series pole with his first top-five finish. "What a phenomenal job," said Dillon. "I started off really good and lost it in the middle but at the end I raced hard and got us a good finish. I just had a little trouble on the restarts." Bodine, driver of the No. 30 Toyota, was leading Peters and a pack of only nine trucks on the lead lap when the night's fifth caution waved to remove the slowing truck of Jason White from the field. None of the leaders chose to pit, setting up a seven-lap shootout. Bodine easily drove away from Peters, who faltered badly on the start from his spot on the outside lane. But Hornaday, who swept both races here in 2008, barged underneath Bodine from third in an attempt to take the lead. Bodine never lifted and had cleared Hornaday's No. 33 Chevrolet when Matt Crafton and David Starr tangled down the backstretch, bringing out the sixth caution on Lap 164 of the scheduled 167. "That next-to-last restart, Ron got underneath me," Bodine said. "I've not always been the best at restarts, just OK. But when you got Hornaday on the outside you got to get it right. That last one, I didn't spin the tires until I got into third (gear). And they got racing hard and ended up giving us a good lead." Bodine leaves Texas with a 65-point lead over Aric Almirola, who finished 12th.